While out running near Cesar Chavez park the last few weekends, I’ve been noticing that the seed heads of the fennel plants are ripe for gathering. (Well…ok. I’ve been a bit slow to get this posted, so now it’s only the ones protected from the wind that are good for harvesting. Like along the bike path near Golden Gate fields where the soccer fields are, or at the more inland parts of Point Isabelle). A couple weekends back I stopped to gather a quarter cupful or so of seeds (NOTE: there are some ginormous gopher snakes out there these days too, especially when it’s very sunny and not crowded, so watch your step! They’re not poisonous but look enough like rattlesnakes to be kinda terrifying when a 5-footer suddenly appears under your feet). Cream together butter and sugar for 2 minutes, then add eggs one at a time, stirring well after each. Add anise seeds and lemon zest, stir. Stir together flour and baking powder. Add in thirds, alternating with tablespoons of orange juice. The dough/batter will be pretty wet and sticky–more like brownie batter than cookie dough. Spray cookie sheet with nonstick spray or line with parchment paper. Drop large spoonfuls of dough onto cookie sheet. Bake at 350F 11-13 minutes, until slightly browned. 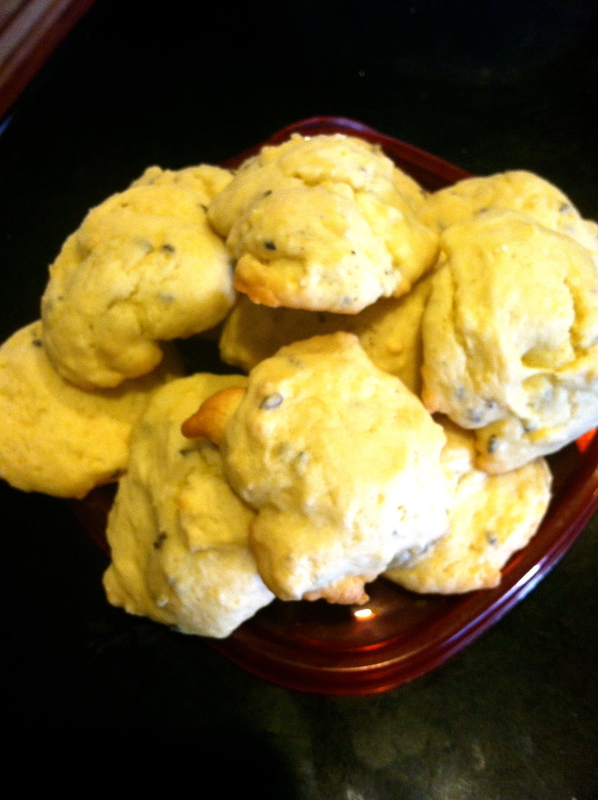 Lemon anise seed cookies. Somewhere between a cookie and a scone, and pretty darn tasty! I really liked them; the soft texture, delicate lemon flavor and kinda-cookie but kinda-scone-y-biscuit-y quality was nice. If you’re not a fan of anise/licorice flavored things in general though, the seeds may be too strongly flavored. There were still some seeds leftover, which my husband used to flavor the beef stock he was making, and that stuff came out delicious.